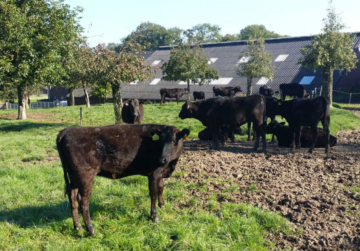 The story of the Dutch Wagyu farm Galouppe. 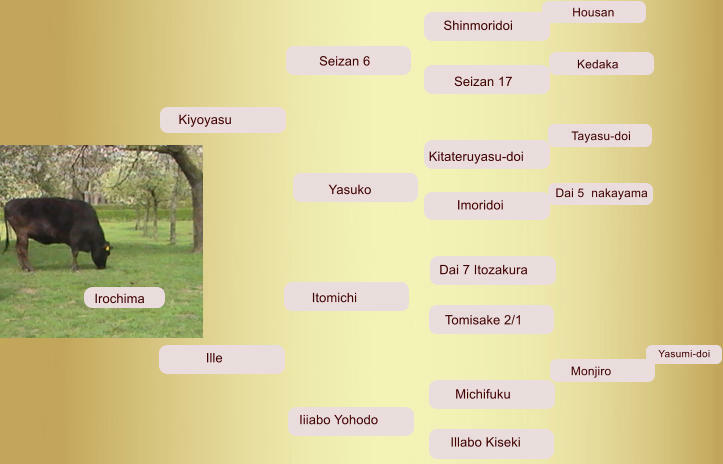 If we study the pedigree from Ille more detailed we see that three bloodlines come together; the Tajima, the Fujiyoshi and the Kedaka line. I’ll explain it to you. On the sire side by Itomichi two lines come together; the Tajima line by dam Dai 9 Itozakura and the Fujiyoshi line by bull dai 14 Shigeru. They produced dai 7 Itozakura, without any doubt one of the most famous and influences bull ever. He marks the beginning of a new line; the Izotakura line. Dai 7 Itozakura was so famous, in fact, that his picture was placed on a Japanese telephone card. The Tajima line is known for small frames but outstanding marbling with a high heritable and the progeny of the Fujiyoshi line is known for large frames, good growth a day (1.02kg/day. This is an outstanding performance, even today!) and good marbling. Dai 7 Itozakura has all that features and he gave these on to his progeny Itomichi and his son Itomichi1/2 who are famous around the world for their marbling, good frames and grow a day. We see these bulls on the dam side. 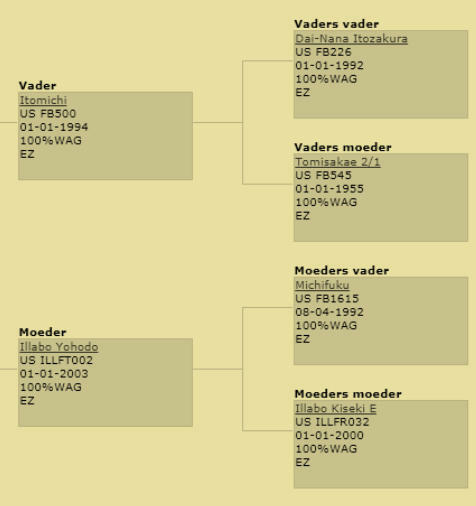 That means line-bred with the genetic top! The great grandmother is Yuriko and she is from the Kedaka line. That strain is renowned for its great growth ability, high meat quality, high feed efficiency and large frames with well-maintained marbling. We see all these features at Ille; she has a hip height of 1.38m, a hip width of 50 cm and a breast size (depth) of 2.36m! We also see Monjiro and his son Michifuku. They are famous around the world for their heritable of marbling. That’s no wonder because the father of Monjiro is Yasumi Doi, from the Tajima line. The second Wagyu was Irochima. The story of the Wagyu. First I would like to take you back in time for a little moment, to the year 1310............... when the famous “Tajima” bloodline was born. (See picture, click to enlarge) Tajima was an old province in northern Japan which is currently Hyōgo and it’s most famous as the birthplace of “Kobe beef”. Kobe is a city in Hyogo (Tajima in early days. Can you still follow me?). So, a Tajima Wagyu is the same as a Kobe Wagyu! But you may only use the “Kobe Beef” brand if it’s bred, raised and slaughtered in that region. Japanese people were (and are still even though it become less these days) eaters of fish and they used their black cows for agriculture work; to pull carts and ploughs, which resulted in developing larger shoulders then backhands. It was also important that they had a quite character. In early times it was forbidden for Japanese people to eat meat. This privilege was reserved for the king and his staff. The “Shoguns” (Japanese military) discovered that they become stronger by eating meat! And they brought there new custom to there villages. The beef from Wagyu is recognized around the world as the best you can eat. The meat is fine textured, incredibly tender and has high levels of marbling (intra-muscular fat). The feature of that fat is that it’s full of fatty acids (omega 3 and omega 6) and it melts by warming. The myths of the Wagyu There are many myths surrounding the massaging of Wagyus or adding beer to their feed. In some regions they believed this aided the animal’s digestion and induced hunger during humid seasons, but it appears to have no effect on the meat’s flavour or marbling. Marbling is set genetic. In fact, animals don’t like it at all if you forced to put beer in their mouth. Another myth is about massaging. The story goes that they did it to prevent muscle cramping on factory farms in Japan where the animals did not have sufficient room to use their muscles. The Japanese people have never heard of it! The sire side of Irochima is dominated by two famous bulls; Kedaka and Kitateruyasu-doi! We saw already at her mother Ille that the Kedaka line give good growth ability and large frames and this is combined with the historical Tajima line; Kitateruyasu-doi. He belongs to the famous “doi” family. Members of that family are renowned for good marbling and meat colour. Body type features are good depth and length also as good maternal characteristics. We can see all these features at Irochima; she has a hip height of 1.33m, a hip width of 42 cm and a breast size (depth) of 2.19m. We explained the dam side (Ille, see above). 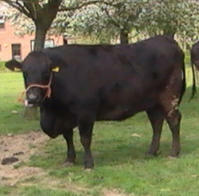 We have constantly females and bulls for sale out of the combination Asayaka Shinnen x Irochima. If you are interested you can contact us. 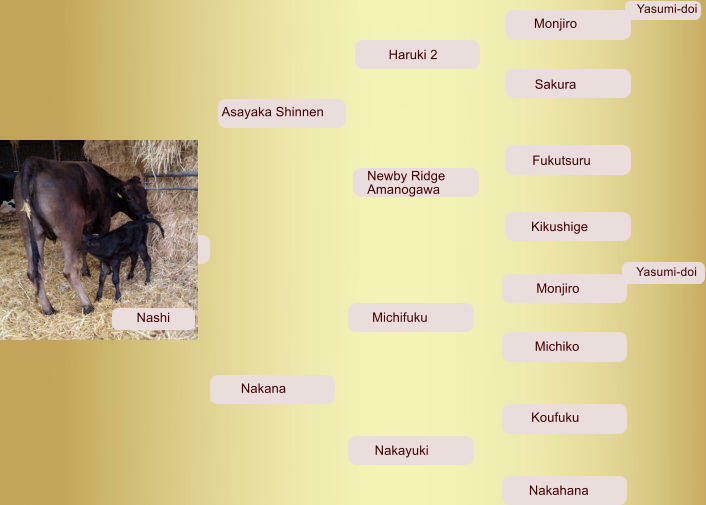 Nashi has also a very interesting pedigree. Her father is Asayaka Shinnen and he was born in the Netherlands. If we study his bloodline we see that the grand sire of Fukutsuru is Yasumi-Doi and the sire of Monjiro is also Yasumi- Doi that means that Asayaka Shinnen traces back twice on that famous bull! On the dame side we see Yasumi-Doi again by his son Monjiro. That means line bred with the genetic top! We have also used her in our embryo program. The story of the Wagyu. 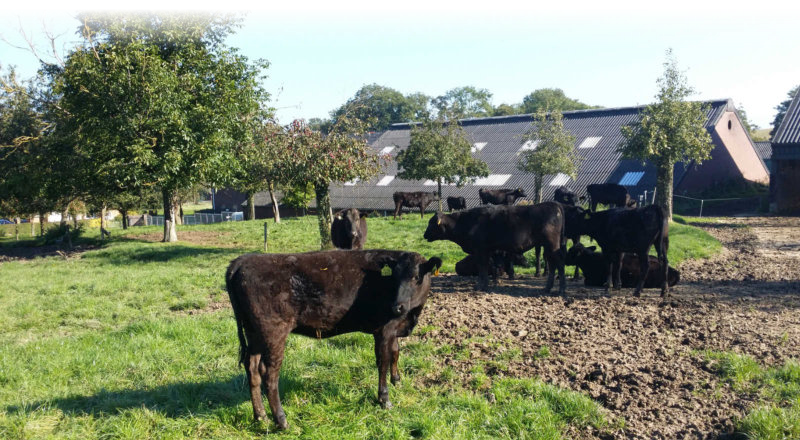 In the summer of 2012 the Dutch Wagyu breeding farm Galouppe started a new challenge; Wagyus, the Japanese cows who are renowned for their high quality beef (it’s named the caviar among the meat.) 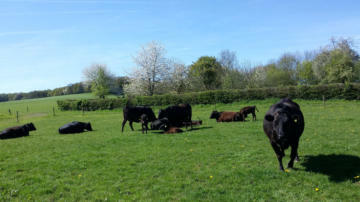 If you would like to know more about their history click For realising our project we purchased the following three maternal cows with original Japanese bloodlines. Ille: Itomichi x Michifuku x Itomichi 1/2 Irochima; Kiyoyasu x Itomichi x Michifuku x Itomichi 1/2 Nashi; Asayaka Shinnen x Michifuku x Koufuku.